Paytm back again with Hot offer. now buy Puma Multi Color Combo of Socks and MP3 Player @174.
original price of only socks is 1099 but with this offer mp3 player is free with this and giving cheapest price ever 174 rs. puma is well known and certified brand we all knows so let's know about this offer. 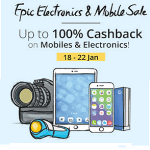 Note – Deal Price is 349 After apply promocode you will get cashback after product will shipped.